Indexes finished flat today, but logged near 5% gains on the week. Stocks opened the trading session in negative territory but climbed throughout the day to end up roughly even. The Dow Jones Industrial Average (DJINDICES:^DJI) lost 22 points, or 0.1% and the S&P 500 (SNPINDEX:^GSPC) was flat, for no change on the day. 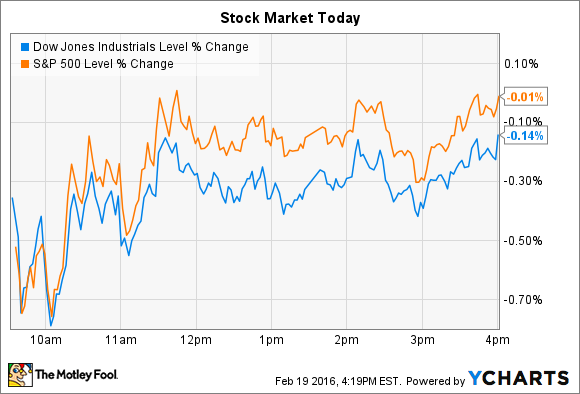 Both indexes managed a strong week, though, notching gains of about 5%. As for individual stocks, Deere & Company (NYSE:DE) and Nordstrom (NYSE:JWN) made notable negative moves today after posting their quarterly numbers before the opening bell. Deere's stock fell 4% after it announced surprisingly weak fourth-quarter results while forecasting a rough year ahead for the farm and construction equipment industries. Fiscal Q1 sales fell 13% and earnings plummeted by 29% as those key markets continued to shrink. Yet despite that cyclical drop, each of Deere's divisions stayed in the black this quarter. "All of Deere's businesses remained solidly profitable, benefiting from the sound execution of our business plans and the success of actions to develop a more responsive cost structure," CEO Samuel Allen said in a press release. Deere lowered its full-year outlook and now sees overall sales falling by 10%. The global agriculture and turf business will take a bigger hit from exchange rate swings than originally projected, executives said, and construction equipment sales are now expected to fall 11% (compared to the 5% estimate issued in November). Deere's outlook for growth in the U.S. economy was also dialed back a notch. A lower cost structure should allow the company to produce substantial profits, even if they aren't at high as investors would like. "Our forecast represents a level of performance much better than we have experienced in previous downturns," Allen explained. Net income is projected to be $1.3 billion this year, down from $1.9 billion in 2015 and $3.2 billion in 2014 . Nordstrom fell 7% -- adding to a more than 30% decline for the stock over the past year -- after the department store retailer posted weak results for the key holiday-shopping quarter. Comparable-store sales increased by just 1% in Q4, representing hardly any improvement over the prior quarter's 0.9% growth pace that management at the time called "disappointing." Gross profit slipped lower as well, falling by 2 percentage points to 35% of sales. Executives blamed an "elevated promotional environment" that required increased price cuts to generate significant customer traffic. The company did slightly better than the broader industry and can at least claim minor market share gains. Management is also encouraged by the steady growth of Nordstrom's off-price business, which improved comps by a healthy 3.6%. That's why it plans to bring its Nordstrom Rack locations up to 60% of the store base by the end of this year. There are 20 such locations slated to open in 2016, compared to just 2 new traditional Nordstrom stores. The retailer doesn't see a quick rebound in the cards. Total comps will be just 1% in 2016, Nordstrom predicted, down from last year's 2% pace. Profits should come in at $3.23 per share at the midpoint of guidance, which would represent no growth over last year's result. Weighing heavily on those results will be a planned entry into the Canadian market, which should cleave about $60 million out of earnings in 2016. Nordstrom still targets $20 billion of annual sales by 2020, up from $14 billion last year.